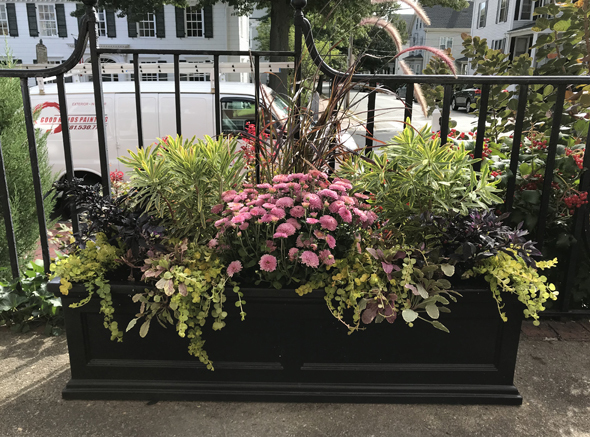 Would you like to spruce up your walkways or entryways with striking containers of bold colors, unusual textures and lush foliage? We have an extraordinary design team available to fill your urns, window boxes or whatever you would like to plant in. You can either bring the containers to Pettengill Farm, or we will come to your place. Since this is an important and featured part of our farm’s work, we suggest you pre-schedule an appointment with us. You will not be disappointed as we will work closely with you to customize you needs. We have a large array of unusual container plants that will keep blooming all the way to our first frost. Our work is displayed throughout the farm and especially in our courtyard and tropical house. 978 462 3675 and ask for the design department to set up an appointment. We look forward to working with you to help you create living ornaments of color and texture for your home and garden.